a certifiable hit in Little Orphan Annie, naturally, King Features wanted an "Annie" of its own. King launched Little Annie Rooney on January 10, 1927, when the strip it was modeled after had been running about a year and a half. Like the Trib's Annie, King's orphan star had a name that was already familiar to the public. But both the 1890 popular song and the 1925 silent movie (with Mary Pickford in the title role) were about different girls called Little Annie Rooney — and when, in 1932, Max Fleischer's animation studio made a cartoon with that title, it was based on the song, not the strip. Except for her very close parallels with the existing strip, this one was more-or-less original. Orphan Annie had a constant companion, a dog named Sandy. Annie Rooney's constant companion was a dog named Zero. Orphan Annie had a characteristic expression, "Leapin' Lizards!" Anney Rooney's characteristic expression was "Gloriosky!" Orphan Annie escaped from an orphanage run by the cruel Miss Hannigan. Annie Rooney's cruel but legal guardian, whom she was constantly on the lam from, was named Miss Meany. Both Annies were small but spunky, and perfectly capable of making their own way in the world. Only two things were missing. The first was the billionaire — Little Annie Rooney didn't have a Daddy Warbucks drifting in and out of her life. The second was the success — Little Annie Rooney did better than any other Annie knock-off, but never even came close to the popularity of Harold Gray's classic creation. King assigned its new strip to cartoonist Ed Verdier, who signed his name "Verd". Verdier wasn't known for any other comics work, nor was he known very long for this one. In 1929, he was replaced by Ben Batsford, whose other strips (such as Doings of the Duffs and Frankie Doodle) were even more minor; and Batsford's tenure gave way to that of Darrell McClure in 1930. McClure, another with few other credits (tho he became reasonably well known for this one) stuck with it for the rest of its run. Starting in 1934, the Sunday page was done by Nicholas Afonsky, the most variously-credited artist the strip ever had — he worked on Secret Agent X-9, Ming Foo, Minute Movies and several others. When Afonsky died, in 1943, McClure took over the Sundays as well. His assistants over the years included Bob Dunn (They'll Do It Every Time, Little Iodine) and Fran Matera (Dickie Dare, Steve Roper). The writer from 1930 until the mid-'50s was Brandon Walsh, yet another with sparse credits in comics. 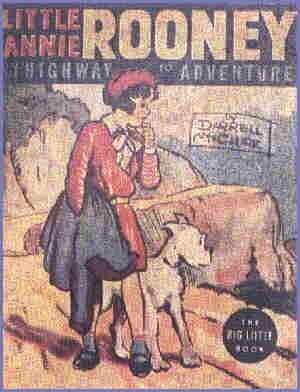 Little Annie Rooney was the subject of a couple of Big Little Books, and publisher David McKay (who also brought out collections of Henry, Thimble Theatre and other Hearst properties) did a slim reprint volume in 1935. She got into regular comic books in 1938 when McKay starred her in Feature Book #11, then continued in the back pages of King Comics, which also reprinted such King Features offerings as Mandrake the Magician, Brick Bradford and Barney Baxter. Annie's next appearance in comic books was a three-issue series in 1948, published by St. John (better known for having licensed the Terrytoons and Famous Studios characters). St. John also reprinted strips in its annual (1948-50) Treasury of Comics, a 500-page compilation that included Abbie & Slats, Casper the Friendly Ghost and many others. That was the last time Annie was seen off the newspaper page. But she continued to be syndicated to a respectable number of papers for years to come. The strip finally gave up the ghost on April 16, 1966. McClure retired, and that was the end of the comics version of Little Annie Rooney. Text ©2003-08 Donald D. Markstein. Art © King Features Syndicate.